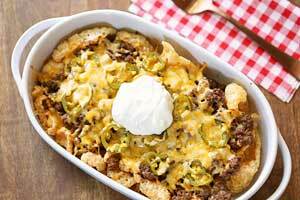 Mexican food need not be high carb! These delicious steak fajitas are ready fast. They are low carb, colorful and very nutritious. Intensely flavorful and spicy but not too hot, these homemade steak fajitas are ready fast. I make them often because they are so easy to make and so very tasty, and my entire fa,ily enjoys them. How do you make steak fajitas tender? Marinating the steak helps to tenderize it. But if you use top sirloin strips, which are not super tender but also not very tough, you can actually skip the marinade. Simply season the beef and the vegetables well, saute them quickly, and these steak fajitas will turn out just as delicious and flavorful as fajitas made with marinated steak. And if you’re willing to use beef tenderloin in this recipe, it will turn out even more tender. I used to think that Mexican food had to be high carb. Tortillas, rice and beans (plus corn) seemed to be an integral part of this tasty cuisine. But then I discovered steak fajitas! These days, when I go out to a Mexican restaurant, I ask for a fajitas mix – steak, chicken and shrimp. Hold the tortillas, beans and rice. I also ask for extra sour cream, cheese and guacamole. It’s a full, satisfying, delicious meal. And it’s low in carbs and gluten-free. How to serve steak fajitas? The classic choice would be flour tortillas (possibly low carb). But for a low carb and gluten free option, you can serve steak fajitas on a bed of cauliflower rice or shredded lettuce. But it’s not really necessary. They are great served on a plate and eaten with a fork and a knife. And that’s how I usually serve them. If you have any leftovers, they keep well in the fridge for 3-4 days in an airtight container. Gently reheat them the microwave on 50% power prior to serving. Personally, I am partial to beef. 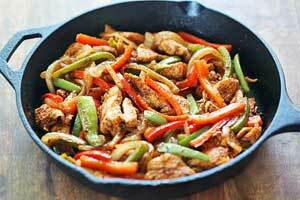 But if you’d rather use chicken, check out this easy recipe for super tasty chicken fajitas! In a small bowl, mix together the seasoning ingredients. Place the sliced vegetables in a large bowl. Sprinkle with half the seasoning mix. Use your clean hands to rub the spices into the vegetables. Place the steak slices in a medium bowl. Sprinkle with the remaining seasoning mix. Use your clean hands to rub the spices into the meat. Heat the olive oil in a large, deep skillet over medium-high heat, about 2 minutes. Add the bell peppers and the onion. Cook, stirring often, until just tender, about 5 minutes. Remove the vegetables to a plate. Add the steak slices to the same skillet. Stir-fry just until no longer raw, 2-3 minutes. Return the vegetables to the skillet. Stir-fry everything together 1-2 more minutes, just until heated through. Spoon the fajitas into warm tortillas, or skip the starch as I do and and serve the fajitas in bowls, drizzled with the yummy pan juices, and topped (if you wish) with salsa, guacamole, sour cream and/or shredded cheddar.